Tag words: pathogenic bacteria, bacterial pathogenicity, invasiveness, toxigenesis, colonization, specific adherence, adhesin, receptor, invasion, invasin, coagulase, leucocidin, hemolysin, streptokinase, phagocytosis, phagosome, lysosome, phagolysosome, immunological tolerance, antigenic disguise, immunosuppression, antigenic variation, protein toxins, botulinum toxin, diphtheria toxin, anthrax toxin, tetanus toxin, pertussis toxin, cholera enterotoxin, adenylate cyclase, staph enterotoxin, TSST, pyrogenic exotoxin, superantigen, shiga toxin, E. coli LT toxin, ST toxin, endotoxin, lipopolysaccharide, LPS, Lipid A, O antigen, O polysaccharide, toxoid, pathogenicity island. A pathogen is a microorganism that is able to cause disease in a plant, animal or insect. Pathogenicity is the ability to produce disease in a host organism. Microbes express their pathogenicity by means of their virulence, a term which refers to the degree of pathogenicity of the microbe. Hence, the determinants of virulence of a pathogen are any of its genetic or biochemical or structural features that enable it to produce disease in a host. The relationship between a host and a pathogen is dynamic, since each modifies the activities and functions of the other. The outcome of such a relationship depends on the virulence of the pathogen and the relative degree of resistance or susceptibility of the host, due mainly to the effectiveness of the host defense mechanisms. Staphylococcus aureus, arguably the most prevalent pathogen of humans, may cause up to one third of all bacterial diseases ranging from boils and pimples to food poisoning, to septicemia and toxic shock. Electron micrograph from Visuals Unlimited, with permission. 1. Invasiveness is the ability to invade tissues. It encompasses mechanisms for colonization (adherence and initial multiplication), production of extracellular substances which facilitate invasion (invasins) and ability to bypass or overcome host defense mechanisms. 2. Toxigenesis is the ability to produce toxins. Bacteria may produce two types of toxins called exotoxins and endotoxins. Exotoxins are released from bacterial cells and may act at tissue sites removed from the site of bacterial growth. Endotoxins are cell-associated substance. (In a classic sense, the term endotoxin refers to the lipopolysaccharide component of the outer membrane of Gram-negative bacteria). However, endotoxins may be released from growing bacterial cells and cells that are lysed as a result of effective host defense (e.g. lysozyme) or the activities of certain antibiotics (e.g. penicillins and cephalosporins). Hence, bacterial toxins, both soluble and cell-associated, may be transported by blood and lymph and cause cytotoxic effects at tissue sites remote from the original point of invasion or growth. Some bacterial toxins may also act at the site of colonization and play a role in invasion. Acid-fast stain of Mycobacterium tuberculosis, the agent of tuberculosis (TB). 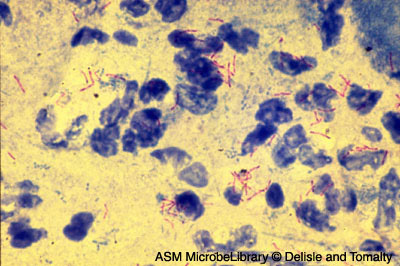 The bacteria are the small pink-staining rods. More than one-third of the world population is infected. The organism has caused more human deaths than any other bacterium in the history of mankind. Although its ability to produce disease is multifactorial, it is not completely understood. American Society of Microbiology, with permission.